A Political Science lecturer at the University of Zambia says the dialogue process must be abandoned because the country is not in a political crisis. Dr. Chris Zumani Zimba says abandoning the process might not be a bad idea considering the confusion that has continued to characterise the process due to failure by both the Church and the Zambia Center for Interparty Dialogue to agree on pertinent issues. He noted that the country’s institutions of governance such as the judiciary and parliament are still functioning and can deal with the issues of constitutional reforms and the public Order Act among others. Dr. Zimba said the dialogue process which was launched on Friday last week by the three Church Mother Bodies will not produce any results due to lack of participation by critical stakeholders such as the Patriotic Front and the ZCID. He said Three Church Mother Bodies and the Zambia Center for Interparty Dialogue have also lost the moral fibre to hold the national dialogue because they have failed to harmonize issues amongst themselves. The Opposition Alliance which compromises of 12 opposition parties has threatened to pull out of the Zambia Centre of Inter Party Dialogue if it continues to disrespect the three Church mother bodies leading the dialogue process. Meanwhile, the Opposition Alliance has warned it threatened to pull out of the Zambia Centre of Inter Party Dialogue if it continues to disrespect the three Church mother bodies leading the dialogue process. Alliance Chairperson for Media and Finance Sub Committees Sean Tembo says government has taken advantage of the financial constraints at Zambia Centre for Inter Party Dialogue to push its agenda of disrupting the national dialogue and reconciliation process. 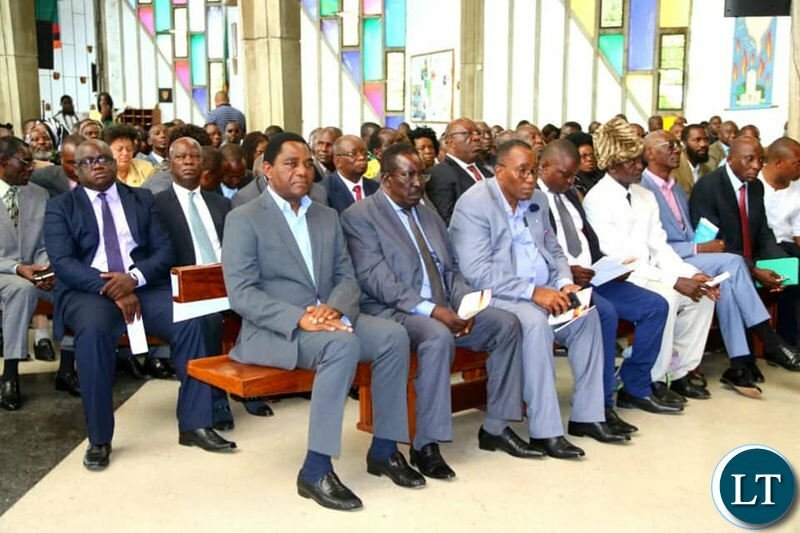 Mr. Tembo said the Alliance is also disappointed with the Conduct of Certain Arms of Government, including the Judiciary and the Legislature Regarding the On-Going National Dialogue and Reconciliation Process in General and the Launch that Was Held last Friday at the Anglican Cathedral of the Holy Cross, in Particular. He said in Convening Last Weeks Launch, the Church Invited Representatives of the Judiciary and the Legislature, in Addition to Representatives of the Ruling Patriotic Front including President Lungu. Mr. Tembo said the PF in General and President Lungu in Particular, Decided to Take a Political Stance and Not Attend the Launch of the National Dialogue Process Last Friday, Which is Understandable Because PF is a Political Party and President Lungu is a Politician. Very true ,like I have always said true dialogue will be in 2021. I agree with Zimba 100% given that all along nothing concrete and substantial has come out. They are just wasting time as we know that all the parties involved will agree on paper but on the ground the status quo will remain the same. Legendary Zimbabwean musician Oliver Mtukudzi who died today, died on the same day as celebrated South African trumpeter and Jazz artiste Hugh Masekela who was a close friend of his. Mtukudzi died at a Harare hospital on Wednesday, January 23. Mtukudzi was rushed to hospital early this week after he was overwhelmed by an ailment at 66. On January 23, another Jazz legend – Hugh Masekela – breathed his last. Masekela died from prostate cancer on the mentioned date last year. He had been battling the disease since 2008. Masekela, who died aged 78, was the recipient of two Grammy Award nominations for his two albums Grazin’ in the Grass and Jabulani, awarded in 1968 and 2011. Affectionately known as Tuku, Mtukudzi was just 23 when he started recording music. UPND is playing everyone but me, Mutati led MMD and PF. What is the so called dialogue about? Talk about what on earth. Like I said all the issues raised by double h and his goons can ably be handled by relevant concerned institutions. The church, ZCID and others are playing to double h’ gallery. When you lose an election, its tail between you legs, regroup and restrategise. See where this agenda-less so called dialogue has led you? Like Green Party president has wisely put it. ZCID should handle political differences if anything, the Church should heal and pray and exorcise dirty spirits outa double h envious and CK’s loud possessed mouth. It’s good to note that the loudspeaker has forced himself into the church. The 3 church motherbodies must not fail to cast hatred outa these wonders shall never end selfish lowlife disgraced losers. Absolutely! Just because some losers personally hate president Lungu, doesn’t mean we need a national dialogue. Someone should advise their under 5 that grown ups actually just pick up the phone, call their so called enemy and clear the air. President Lungu should stay far away from this sand box. It was said ZCID are sponsored by PF. They denied it. The other side insisted. ZCID withdrew. PF also withdrew. We shouldn’t jump into conclusions; but we are being pointed to where to jump! Another Zimbabwe in the making, Sesheke, Western Province deserted as police invade the town beating up anyone in sight. It has become infectious, while the human rights crisis currently obtaining in Zimbabwe is of sufficient gravity to warrant an ICC investigation because, according to the Zimbabwe Human Rights NGO Forum, at least 12 people have been killed, 78 shot at and 240 faced assault, torture, inhumane and degrading treatment. Village meeting should be abandoned because there are no funerals. Some lecturer, a man with name Zimba can’t wise. Dr. Zimba is spot on! This is time to put this dialogue behind us. Its a failed process and one being turned into a project by the Church for regime change in 2021. They are elements within the Church hiding behind the veil of the priestly cloth when they are just politicians or they are there to enrich themselves like most of these NGO leaders. The position by these elements within the Church may not represent the entire Catholic Church in Zambia and that is why am looking forward to the position in a pastoral letter signed by all Bishops. Let’s abandon this dialogue. In the dialogue everyone is waiting to punch lungu in the face, it will be a field day. This is a good narrative especially if the meeting is held without president Lungu. One would have thought that the tension so much talked about are between the PF and UPND. The majority of the “one man parties” rubing shoulders with HH are oblivious to the fact that they are just promoting HH’s ambition and not theirs. Any dialogue without the statutory body ZCID and the PF is a futile public exercise. At one point our chief in Luapula was barred to attend meetings, because he accused every successful person in village as witch. He sees a green maize, he sends kapaso (messanger) to spend rain night in that field to see if anything at night. Kapaso got sick of nymonia, believe me there was pandamoniam in that chiefdom. Some of you can remember in 1997. But there is no way they could out him out. Maybe village dialogue in 2021 will work. The Judiciary and Legislature are not political parties, the dialogue is for Political Parties. It’s a national dialog they are having and not a political dialog. It’s why the stake holders wanted the church involved not ZCID alone. Shallow mindedness is one indicator of failed impact of education on a person. It is longer and more expensive to reconcile and bring back nation development on track once blood has been spilled and lives lost. The constitution is in a crisis, voting day a nightmare, wearing opposition party regalia is risky, Public Order Act is selective, Electoral Body and key institutions of governance are compromised etc. Is this Dr on planet Earth? I doubt his thinking!! Fred M’membe says the southern African region has letdown the people of Zimbabwe for too long and that the trend cannot be tolerated anymore. Dr M’membe, the Socialist Party (Zambia) 2021 presidential candidate and the leftist party’s deputy general secretary, said the plight of Zimbabweans required the region’s urgent attention. “It’s unbecoming of our regional leaders to leave these defenceless citizens to the mercy of the police and military. We have letdown the people of Zimbabwe for too long. This cannot be tolerated,” Dr M’membe stated on behalf of the Socialist Party (Zambia) Politburo. … Zimbabwe where government authorities have waged a crackdown on citizens protesting a more than 100 per cent fuel price hike. He stated that what the working class in Zimbabwe was facing was unjustified brutality. Dr M’membe wondered how an administration that campaigned on a platform of reviving the economy and democracy could descend on its citizens using its military power. The fuel price hike, which was announced by President Emmerson Mnangagwa on January 12, saw petrol prices rise from $1.24 per litre to $3.31 with diesel up from $1.36 per litre to $3.11. “At these prices, Zimbabwe has the most expensive gasoline in the world per litre. The next highest is Hong Kong at US$2.06. How can the Zimbabwean government justify this?” Dr M’membe asked. “SADC leaders have been firm condemning the West on sanctions on Zimbabwe, and rightly so. But why are regional leaders and the African Union mute over the regime’s brutality against innocent citizens? And this annoying silence seem premeditated!” he stated. … arrested and several other civilians were “murdered or maimed” in the aftermath of the disputed July 30, 2018 elections. “Again, today when our innocent brothers and sisters in Zimbabwe are being shot at and opposition leaders are forced into hiding over the unbearable socio-economic situation, President Lungu and his SADC colleagues seem to be blind to the reality! These people are not attacking the system. They are pleading for a livelihood. Here are the citizens who have stood by the ZANU-PF through the thick and thin since independence. To be killed for asking the government to reconsider the hyper fuel price and to address food scarcities cannot be tolerated,” he stated. And Dr M’membe stated that the views of the Socialist Party on the situation in Zimbabwe coincided with those of the Zimbabwe Human Rights Commission (ZHRC), which recently raised concern about the fast deteriorating economic situation triggered by the recent monetary and fiscal policy pronouncements in that country. Dr M’membe added that the Zimbabwean government ought to realise that it was the sole duty bearer in terms of addressing economic challenges currently obtaining in the southern African country. … “No one in our region, including the world at large, should gloss over what Zimbabweans are going through. These are people who are patriotic and hard-working. They have stood by their government in the midst of high cost of basic commodities, unemployment, scarcity of fuel, high cost of medicines or lack of it, among other socio-economic challenges,” stated Dr M’membe. Fuel prices look high because Zimbabwe has a parallel monetary system due to lack of money exacerbate by the biting SANCTIONS the western countries have imposed on the people of Zimbabwe. The official price per litre is still $1.40 which puts at par with Zambia but due to lack of hard currency the parallel amount is double. REMOVE THOSE SANCTIONS FIRST!!! I set the parameters for dialogue to succeed, the church did not respect them, and now it has come to pass. What is so special about these three church mother bodies that we can trust them to be neutral arbiters? They are just citizens of Zambia dressed in church regalia and collars and crucifix, it’s just a uniform, just like party cadres have their own regalia. And what is Sean Tembo talking about? Opposition alliance rubbish…. you fuc.k’n trib.al!! Zambia as a nation is experience economic growing pains. This is what our opposition should be talking about, not always insulting Zambian people’s intelligence plus siding with imperialistic corporations. Less talk and politicking please. its indeed terribly to lose power but whatever happens whatever goes up will one day come down no matter. this can be only be the kicks of a dying horse in slow motion very painful indeed. you cant start fighting men of god. its a direction lost. Let’s hold the dialogue for Reformation of our constitution as politicians without the church. Siavonga meeting was held without the church and everything went well but the is brought to church and confusion starts. Why? I very said this before and l am saying it again, dialogue is for DRC and now ZIM. No space in Zambia, we have a functioning Government. Don’t forget that bye elections come with voter apathy which was >70% in PF strongholds and <10% in Akainde's. Question is how come voter numbers in southern province remain very high despite migration, deaths, etc? #11 blackbull, men of god my foot! More like a bunch of glory seeking trib.als. The men of God were those who led the dialogue between KK and Chiluba, not these attention seekers, I bet they only read the Bible when they want to quote a verse or two to sound clever. If the three church mothers cannot reason or reconcile with members of their own flock e.g. ZCID you call them men of God and holy? If you doubt what I am saying just check the unholy words of Rev Chikoya, supposedly a member of the church dialogue team. If I were the Catholics and Evangelicals, I would have abandoned this trib.al and reconcile with ZCID. What is the whole dialogue about when the country doesn’t even know the whole agenda about the so called dialogue?? Please, us Zambians want to know what is the agenda for this dialogue or else it’s just another electoral petition for 2016 to those who are still mourning even today. The three church mother bodies are hired hypocrites by hack heck inclusive those surppoting this animal called dialogue. Are there two governments in Zambia for her to be subjected to dialogue. Think twice and stop quacking. Let the president alone please. If you want to see state house go back to the boxing ring and put on boxing gloves and this should be in 2021 so that we see who’s stronger between the two. Not dialogue, dialogue for what to dialogue on? So called father chikoya ( child less father) sound like a political cadre.One more thing I like calmness of H.E . the president. There are only 2 types of pipo who supports Lungu. Those whom having Lungu as a president 1. lifts their ego and those 2. benefiting financially.They don’t care about naional devlopment or hw well lungu executes his job. This Mr zimba is such a person. They don’t see anything wrong with lungus misgovernance bcoz their ego is too big to see that.